Much has been said in the press in last few weeks about neighborhood organizations and their increasing role in city affairs. I am proud of the accomplishments of the Midtown Residents Association MRA and the loyal and talented members of our steering committee, members who are elected at a general meeting from a board-proposed slate of candidates, and who volunteer their time to improve the quality of life in Midtown. Our accomplishments are seen all over Midtown. The vivid mural by Elizabeth Lada on the side of Longs is the first for any Longs anywhere and the first public art for Midtown. This mural will be soon be followed by a nearby Poetry Wall, the successful introduction of the restaurant Como Esta-again the first deli for any Walgreen's-and the approval of an additional traffic light for Midtown Center safety. We advocated and won approval for ground floor retail protection in Midtown and Charleston Plaza, which will ensure neighborhood-serving stores occupy the ground floor in our neighborhood centers. We have worked with our city council to promote a city ordinance on urban blight, facilitated many small interventions on behalf of our members, and attempted to recruit businesses, such as Trader Joe's, to our Center. We have key focus areas, much as the city council does, to prioritize our efforts. We take positions before the city council and commissioners on topics that we feel are in the best interest of Midtown. These areas of focus have included safety for pedestrians, bicyclists, and cars; as well as proper zoning for noise, lighting, signage, parking and landscaping. If we do not think there is a clear community consensus on issues, we convene a general meeting for more discussion. Can we do more? Absolutely. But to accomplish more, we need broader involvement and increased membership. Our organization is less than 10 years old. We continue to grow and evolve with our residents and members. As Chair, I urge you to join us and let your voice be heard. Attend MRA meetings, bring/tell a friend, join a committee, become a block captain. Come out, be informed, send us your thoughts. We will continue to make connections with more Midtown residents throughout the year, including an MRA awareness campaign in the summer with an information table in Midtown Center. We welcome your participation in our meetings, our committees, and social events. Our association is open to everyone who lives in Midtown. We continue to work on getting the word out about MRA-who we are, what our priorities are, how to contact us, notices about our meetings and events-through our newsletter, our frequent enews, and media publicity. Our web site is a handy source of events, current issues, and past newsletters, as well as how to contact us. Our outstanding emergency preparation section is linked to from many other associations. Our ongoing project on emergency preparedness. We meet together to learn more about topics such as How to Read a City Budget as well as keep on top off what is coming up in the Zoning Ordinance for our commercial centers and residential housing. We believe that these connections have improved our effectiveness and established friendships that will link our community as we work together to keep and improve our quality of life in this great city. Our next general meeting is Thursday, June 5th at 7:30 PM at the Friends Meeting Hall, 957 Colorado. The topic is Traffic Talk with Steve Emslie and Joe Kott. 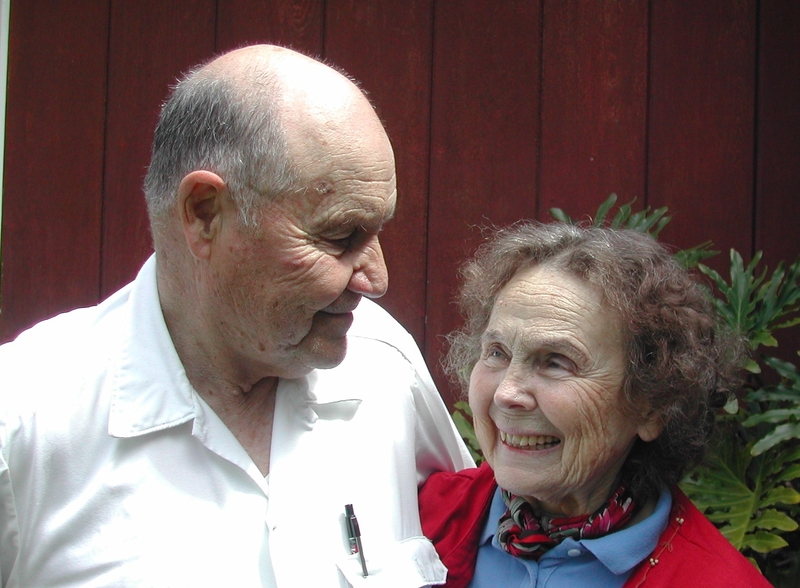 Alvie Hartsog and his wife, Martha, have lived at 730 Moreno since 1955. Their children grew up there. Now their three granddaughters' pictures and playthings fill the living room. Alvie built the house himself on a spot that used to be the cutting yard, where all the 4 x 12 cedar planks used for the all the forms, for all the houses built in the neighborhood were cut. When the floods of 1957or 1959 came, he carried sandbags to help hold back the water. Purity Supreme, the supermarket where the Coop was and where Walgreen's will be, had a bad curb that led the water straight to his lot from their parking lot. After the flooding fears, Purity quickly extended the curb another six or eight feet and the water was no longer a problem. A CAL grad, Alvie served in the Pacific in World War II. When he came back to the Bay Area after the war, housing was scarce. While taking a walk in San Leandro, he looked out from a hilltop and decided that he needed to help build houses. I found a project, he says, to describe the building of houses on the Hayward side and then, this side, of the Bay. Besides houses, he built shelves for places like the old Emporium Store at Stanford Shopping Center and Norney's in Midtown during more than 40 years as a carpenter and member of the Carpenters Union. He remembers a young activist named Ralph Nader stopping by to try and settle a dispute -- Ralph was unsuccessful. Public Art --- What is it good for? It must have some benefit because the effort to beautify the more mundane features of the urban and suburban landscape has been around since cave dwellers enhanced their rocky surroundings to tell a story and record their culture. If you Google "public art," you'll be rewarded with 281,000 sites that review public art all over the world, from western Australia to The Hague in the Netherlands. What is it in the human psychology that motivates us to embellish our public surroundings and to enrich and enliven public areas with works of art and sculpture? Certainly some of it is political, such as statues of leaders, whether loved or loathed. And some of it is historical, to memorialize events or to communicate a sense of place. Still other works are for sheer pleasure and fun, or are intellectually provocative and unsettling. Their common denominator is to provide a backdrop to our more common surroundings, forcing us to engage our own intellects, emotions and memories. As Picasso said, "Art is a lie that helps us realize the truth." Repressive societies always seek to control public art and use it as propaganda for the regime's agenda. Free societies are more permissive of the style and message contained in public art for the reason that, although creativity cannot be extinguished in even the most totalitarian society, it is fairly understood that freedom of expression is the lifeblood of the creative spirit. Whether we are interested in public art or like one piece or another, every piece of public art in our community is evidence of our community's respect for the freedom of creativity manifested by each artist, and the freedom of each person viewing the art to experience and appreciate it in his or her own way. And therein lies one of the most enduring values of public art -- as a reminder of our shared values, heritage and culture within the context of the individual's freedom of thought and expression. But do you stop to touch? and leave them standing in this middle field. "Being Six in My Neighborhood"
I try to do the things I should. I like to give cookies, pet cats, and play. part of a longer poem. Here is the entire work. Skipping, scattering wildflower seeds on the sunlit ground. Your eyes twinkle back at me. We are tending the same garden. After years of effort, the last step in getting approval for the traffic light and street reconfiguration at Bryson and Middlefield has find been made. City Council approved the project on May 12 and the work should be done later this year. After a request to the Traffic Division, the newly painted parking spaces next to Baskin Robbins were removed. Because the south wall of the Walgreen's building will soon be a "poetry wall" as part of an MRA/Public Art Commission project, we were concerned that the narrowing of the alley by allowing parking invited danger to pedestrians. Also please note that the alley is actually a fire lane and is now a one-way exit from the back of the center. We also worked with the traffic department and Public Works to have an exit curb painted red to improve visibility for those exiting from Creme de Caf� onto Loma Verde. Along with the Zoning Committee, we worked with the manager of the west Midtown Center property to ensure that adequate parking will be in place with the opening of the Mint Leaf Vietnamese restaurant. This will include 20 minute parking in the spaces in front of Papa Murphy's and Blu-White Cleaners. We submitted an analysis of the impact of the Comprehensive County Expressway Planning Study regarding the potential impacts on Midtown if changes are made to Oregon Expressway. See the county report is at http://www.expressways.info/ and our analysis. Four Midtown residents participated in the "Residential Streets Livability Research Project" focus group, a joint effort between the Transportation Division and the Stanford Program on Urban Studies as part of a research project regarding traffic effects on the quality of life along residential streets. The Alma Plaza neighbors are working on the potential traffic impacts of the renovated shopping center and convinced the Council to include the area as part of the Charleston Corridor Traffic Study. We attended Planning Commission and ARB meetings regarding the Baylands portion of the Matadero creek project, encouraging the passage of the plan with reasonable habitat mitigation. We also taped a third community journal segment on Matadero Creek. Construction in Midtown will begin next month. Louis Road will be closed and the bridge replaced when school lets out. Additional streets will be impacted as other bridges are also repaired. Residents will be notified when work is scheduled and the MRA will also hold a meeting next month about the construction plans. We also facilitated meetings between Public Works and residents of a court where water was not draining properly after a sidewalk replacement. A workable solution was reached to all parties' satisfaction. Friends Meeting Hall at 957 Colorado. A call to action: We encourage all Midtown residents to actively prepare yourself, your family, your neighborhood and your community for serious emergencies and/or disasters. By doing so you'll increase the likelihood that you and your loved ones will survive such an event. You'll gain piece of mind in these troubled and confusing times. You may find that sharing the task of preparing together-building community-is very rewarding. Here are some things that you can do right now! The Midtown web site is an excellent reference for disaster preparedness. Additionally Palo Alto REDI just announced a new city wide web site www.paloaltoredi.org for disaster preparedness as well as two list servs which are now operational for community connectivity. The first is "announcements" for event broadcasts, and the second is "community" for everyone to discuss preparedness. See www.paloaltoredi.org for instructions to sign up. MRA is starting a Committee on Disaster Preparedness to include block captains, PANDAs (Palo Alto Neighborhood Disaster Assistance) and others interested in this topic. We encourage you to sign up for PANDA classes sponsored by the City of Palo Alto Fire Department (we announce classes on www.midtownresidents.org) and attend Red Cross courses. Along with this, MRA is actively recruiting neighborhood block captains (block captain's role described at www.paloaltoredi.org/downloads/role_of_block_captain.pdf) and will hold a meeting at 6:00 PM at the Friends Meeting House for those who are interested in organizing your block. This will be right before the Red Cross presentation on "Preparing for the Unexpected" on June 24. We are interviewing folks to be the Chair of our emergency preparation committee. For questions or to apply call Annette at 321-1280 or email Annette_G@att.net. The Midtown Residents Association wants to represent you and your issues. We seek your feedback about our focus issues and ongoing programs. By becoming a member (and sending in your email if you have one) you enable us to work for you and represent your issues to council, staff and the city commissions. There is strength in numbers! Join us! Everyone 18 and over living in Midtown is automatically a member of the Midtown Residents Association (MRA), but the organization relies on your voluntary donations to keep you informed and to organize our fall "Ice Cream and Issues" social and other MRA activities. If you haven't gotten around to contributing in the past, now is a great time to do it! If you've given in the past, you are more than welcome to give again! Membership is $10, but contributions of any amount are welcome. Send your check made out to MRA to our treasurer, Sylvia Gartner (see membership form). Topic: Traffic Talk - Issues will include how the Charleston Corridor Study and moratorium impact Midtown, the new traffic light at Bryson, what traffic "calming" really means, and the impact of the Matadero Creek construction.